Recently I have been plagued by this thing I like/hate to call the death cold. It's that cold that starts out with the sniffles and watery eyes and then before you know you are hacking up a lung and sound like a man who tries to be woman. You know what I'm talking about. I know you do. Hair update- As you can see, I have gone over to the dark side. My hair is officially a mocha brunette. I am LOVING it. 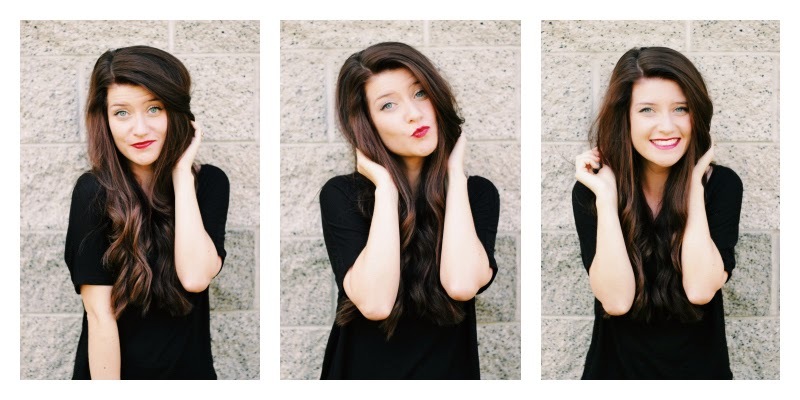 If you live in the Utah county area and you are in need of a new hair stylist, check out Kaity HERE. I am SO overly picky with who does my hair. This girl did not disappoint. I haven't been this happy with my hair in a looooong time. So currently and recently I fell back in love with my hair. TV shows- I am actually a tvaholic. It's not a problem and I swear I can quit at any moment. Don't try to call my bluff on that. Anyways. I am straight up addicted to so many shows right now. So here is my list of recent must watch shows. 1. Manhattan Love Story. You HAVE to watch this show. I get depressed after each episode when I realize I have to wait an entire week for the next. Good news for you is if you start watching now…you can binge watch like 5 episodes. Go NOW. 3. Utopia. You guys…just please do not judge me if you try to watch this. It's horrendous. It's a train wreck you just can't look away from. I'm over it after every episode and then bam next week I just go back for more. 4. Walking Dead. Husband and I stayed up until FOUR in the AM to binge watch season four before season five premiere. I need this show to be over so I can quit having nightmares and thinking people walking in the streets are zombies. It's no good for my health. 5. (yes I am STILL going) Nashville. Mostly I just want to listen to the music ALLLLLL day long. The Gunner guy is also pretty cute. I guess. I could go on but aren't you guys bored? Ok….I am also re watching every single stinkin' episode of Gilmore Girls. It's a crack up. Every. Time. I am a recent faller in lover of THESE bad boys. I refuse to take them off my sick/weak/shivering sick body. If you don't own a pair…I am truly sorry. Recently all I can listen to is the Acoustic Evening playlist on Spotify. It is the perfect balance of soothing and depressing. Because I'm sick…and I want to be soothed but I also want to feel bad for myself. So there's that. A recent discovery on the sick front is that Halls Vitamin C taste like candy. Amazing candy. So I can't be mad about that. Also, Nyquil maximum strength is a horrible idea. There are happier recent things in the works over here but I can't focus on them because I am coughing every .25 seconds and also they are a secret. So wait for it! Now… I am going to go eat cookie butter out of the jar and watch some tv, cause I can, and cause I want to. I watch all those shows and then some so I totally get it. No big deal. Also just caught the plague cold, so twinsies. And LOVE your hair. Good look. I love TV. I prob follow at least 10+ shows. I have to catch up on suits and parenthood, but after that.. I can't wait to try out how to get away with murder and manhattan love story! binge tv is the best tv! Being Canadian in the USA.